Suitable for decorating photos, kalasam, etc. 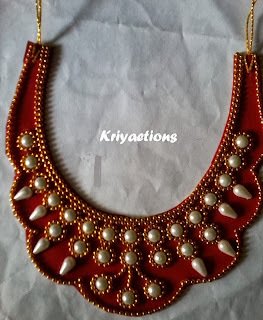 Made on felt cloth with OHP sheet as a base to give support and with flat base pearls and gold chains. This neck piece is a ready decor for your gowri kalasam during varalakshmi puja, gowri poojas, etc. This also can be used on photos of gods and goddesses.